At Modernizing Medicine®, we are looking for passionate, innovative and creative rock stars! Our employees are energized by challenge and the sense of accomplishing great things. It takes more than just a great product to modernize medicine. It takes a great team. The work we do makes a difference. 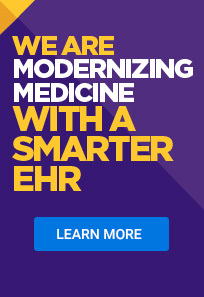 Our web and mobile applications are transforming healthcare information technology to increase practice efficiency and improve patient outcomes. Our innovative and collaborative culture fuels our growth and creates rewarding and empowering experiences for our team. Read the blog post to learn more about Modernizing Medicine’s unique approach to hiring. The collaboration and exposure to new experiences create room for our employees to grow and work in an optimal environment. Aside from the wonderful people, we have fun amenities for our employees to indulge in: catered lunches twice a week, breakfast on Fridays, a “fit” workspace room with treadmill desks, a Zen meditation room, monthly “First Friday” meetings and happy hour events, quarterly massage therapy and much more.